Another month down. 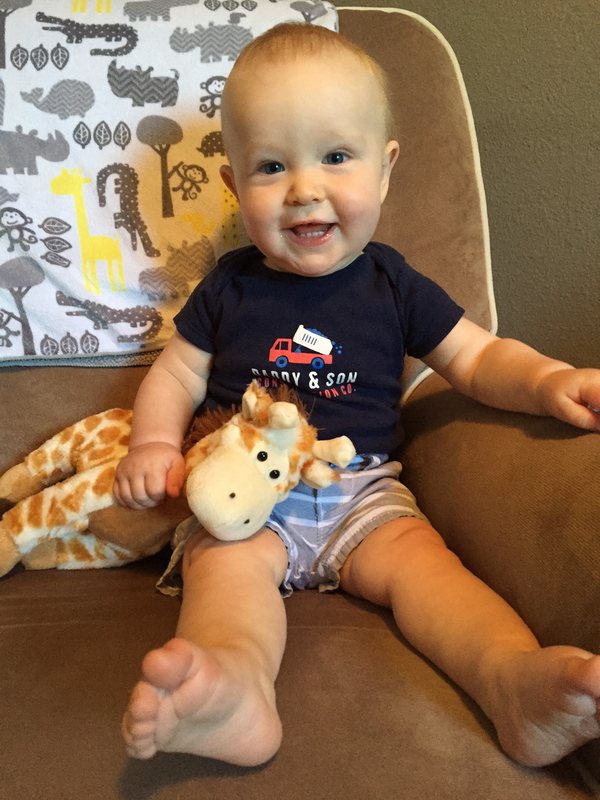 . . .Cullen is 9 months old today! 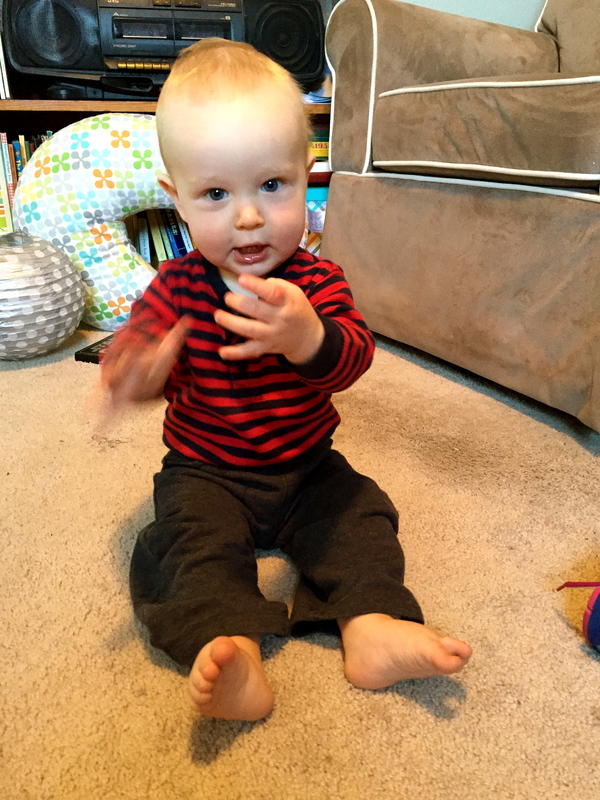 I’m continuing to recap what our days are like each month for the first year of Cullen’s life. I feel like I just did his 8 month recap, but that’s what happens when you are busy traveling! Here’s a look at our day today. 9:00 p.m. Cullen goes down for the night. (This is later than usual, but then again, what is ‘usual.’) With all of our travels, it has been hard to get into a good routine, but we make do. He just ends up going to bed a little later and sleeping in later in the morning. 2:00 a.m. I hear Cullen fussing in his room. I try to let him fuss it out for a while, but he isn’t quieting down, so I go nurse him back to sleep. 5:30 a.m. Cullen is up again. (We’re still at two wake-ups per night.) I nurse him back to sleep again. 7:40 a.m. Diaper change, put on regular clothes, and eat again. 8:00 a.m. We go downstairs to have breakfast. 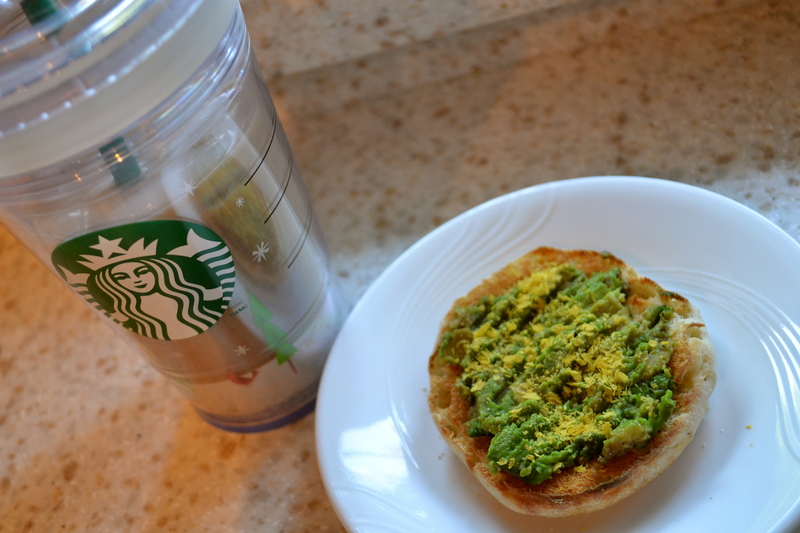 I have avocado on an English muffin and iced coffee along with a bowl of cereal. Cullen has banana and some English muffin. 8:30 a.m. Cullen and I go upstairs to change his clothes and diaper since he is sopping wet from drinking water at breakfast. 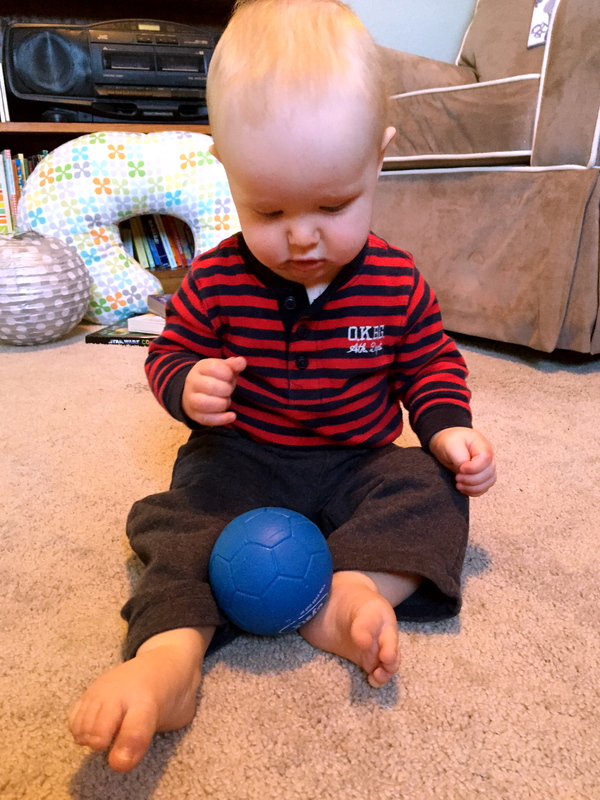 We play for a while: reading books, playing ball, and whatever else Cullen finds interesting. 9:00 a.m. Time to get ready to go running. What used to only take 15 minutes takes three times as long these days, and I always make sure to start getting ready early because I always end up needing the extra time. I change into my running clothes, brush my teeth, and pick up the bedroom. I’m sure I do a million other things, but now I don’t even remember what they were. 9:40 a.m. We leave to go meet a friend for a run. 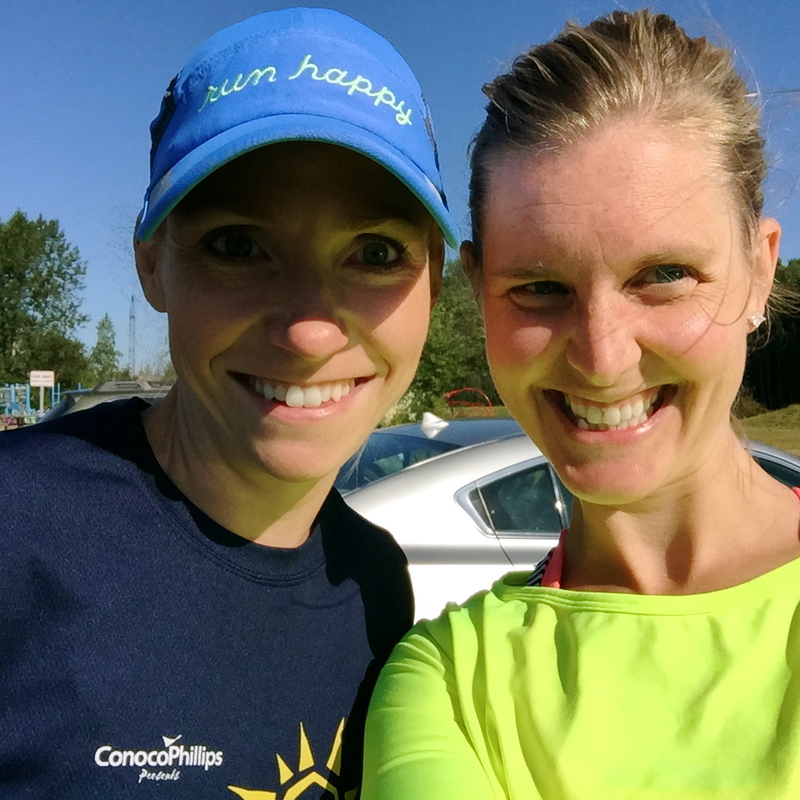 10:10 a.m. 6 mile run with my friend Erin. 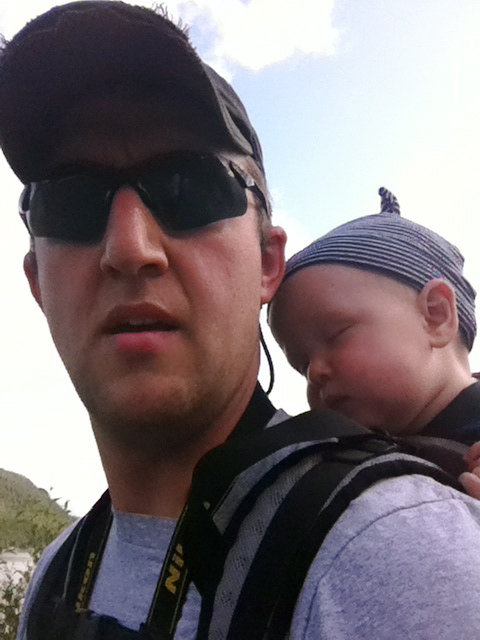 Cullen fell asleep after 3 miles. 11:00 a.m. Run done. We stretch and load the car back up with everything. I stop by the store (Skinny Raven) to drop off some boots I borrowed from my coworker, write down some hours, and buy Nuun. I was planning on going home after that, but I was talking to another coworker about my need to find a dress to wear to my brother-in-law’s wedding next weekend. She suggested stopping by our sister store (Her Tern) across the street. Duh! I don’t know why I didn’t think of that before. So a quick errand turns into a whole trying-on, buying experience. 12:20 p.m. We finally head home! By now I am starving as I haven’t had anything to eat since breakfast this morning. 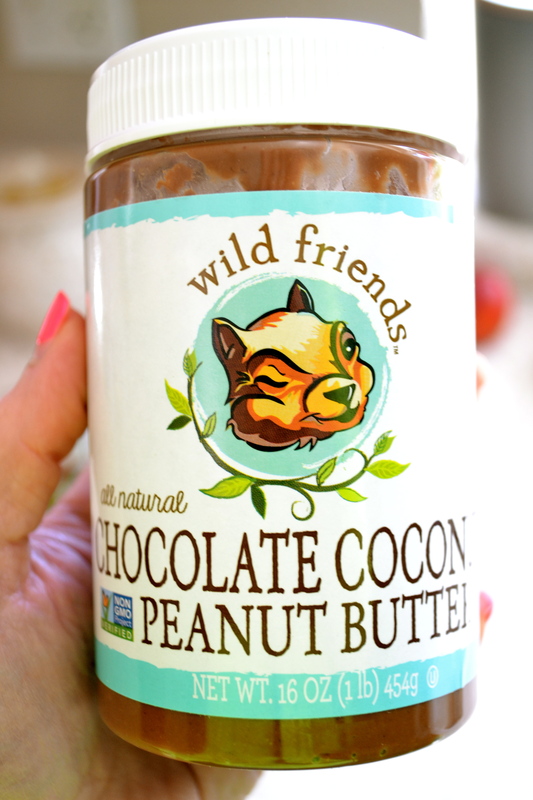 I also have a few bites of this chocolate coconut peanut butter. I like it but don’t love it. Maybe I was expecting it to take more like Nutella. 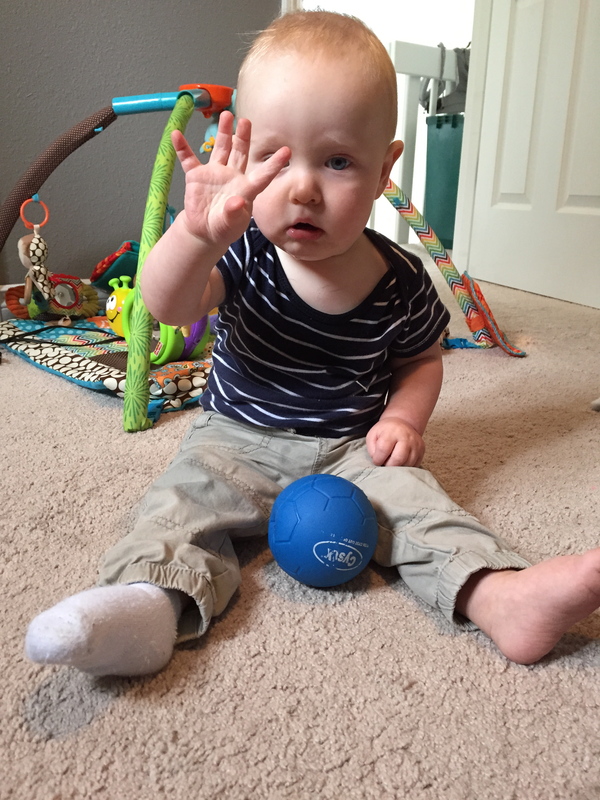 1:10 p.m. Leave to go to our 9 month pediatrician appointment. 1:30 p.m. Pediatrician appointment. 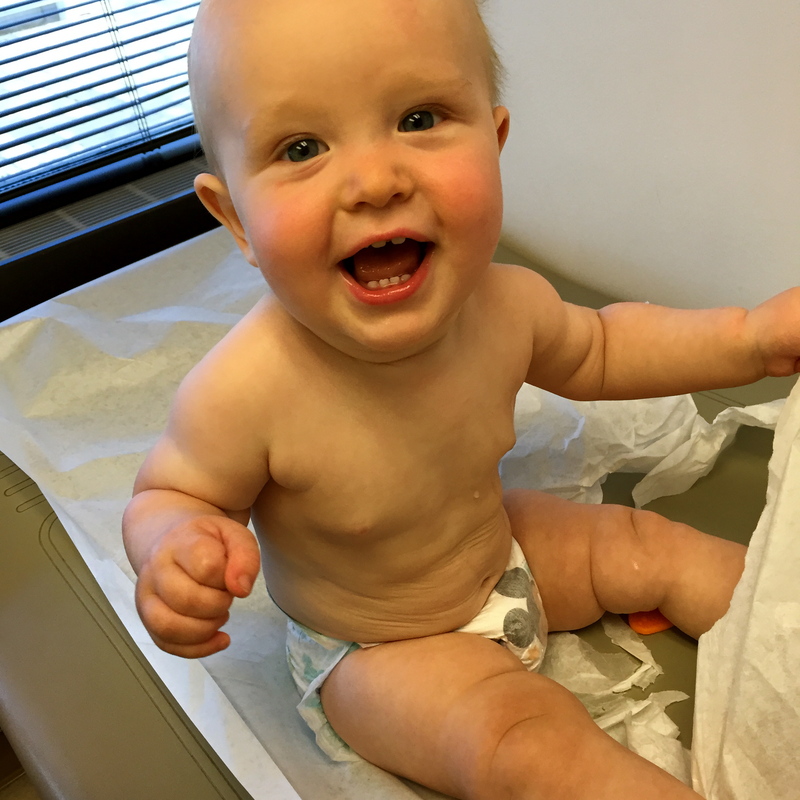 Cullen is in the 71st percentile for weight, 100th+ percentile for height (He grew one inch a month in the past three months. ), and 95th percentile for head circumference. 2:15 p.m. We finish up at the pediatrician appointment and make a pit stop at Starbucks to pick up a little treat for Craig. I was hoping to keep Cullen awake, but he was out within two minutes of getting in the car. 2:45 p.m. We stop by Craig’s work and show off the sleeping Cullen to his coworkers. 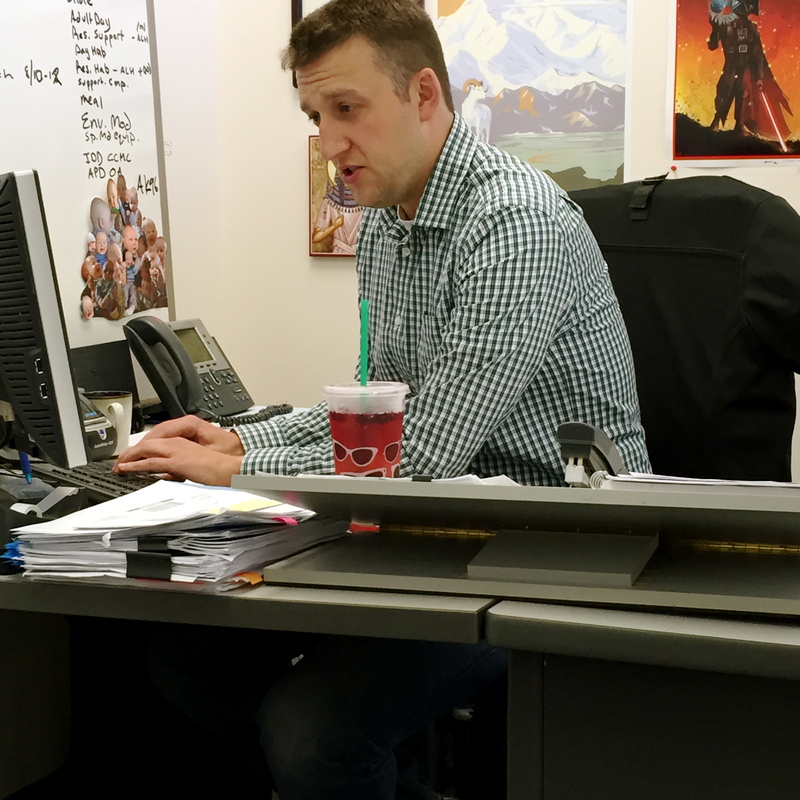 We go into his office and Craig crinkles some papers and wakes Cullen up. No! Of course now he is up and bright-eyed and bushy tailed. I threaten to leave Cullen with Craig since he woke him up. 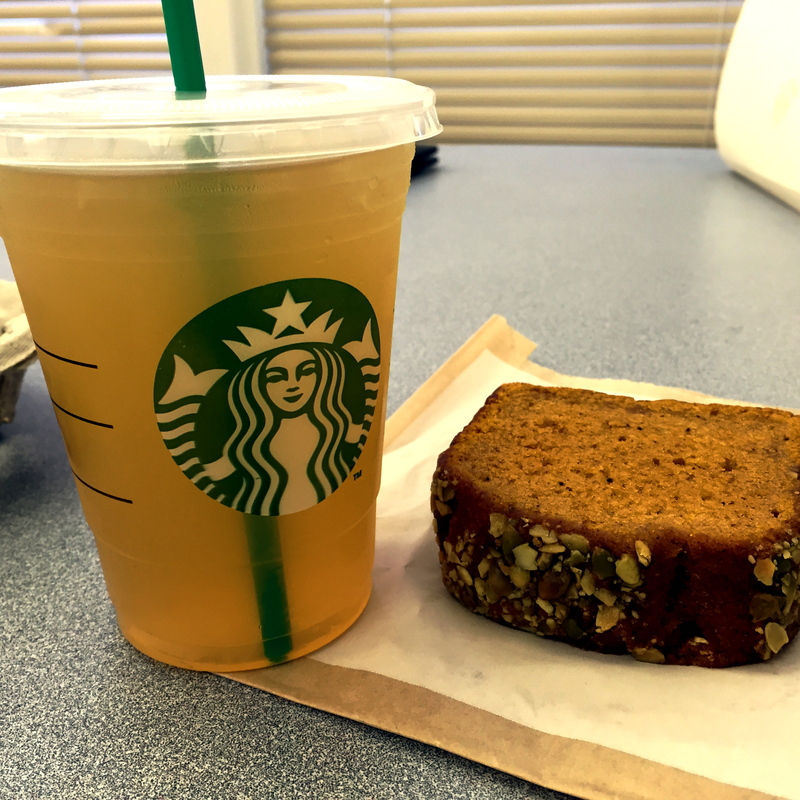 I ordered a green tea lemonade for myself and a piece of pumpkin bread. The green tea lemonade was really sweet. I added water to do to dilute it. The pumpkin bread was good, but every time I have something from Starbucks I regret my decision. Besides being really sweet the lemonade flavor was fake-tasting and the pumpkin bread was obviously not very healthy. 3:10 p.m. Time to head back home. I was planning on Cullen sleeping during this time, but once he’s woken from a nap (no matter how short he has been sleeping) he’s up for a while again. 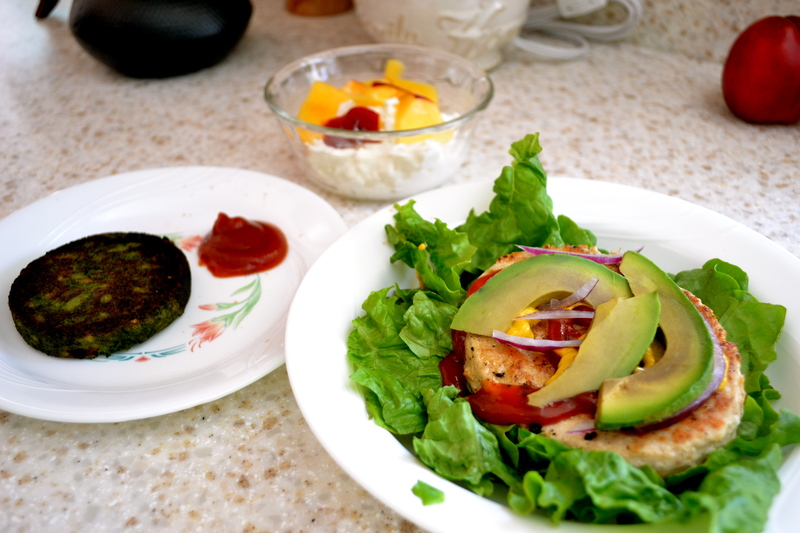 When I get home, I reheat my turkey burger and clean up the kitchen. Also time to change Cullen’s diaper and clothes again. He drooled all over his shirt. 4:10 p.m. We head out the door again to run some more errands. (We never go this much during a normal day. Sometimes we stay home all day.) This time we’re headed to Nordstrom to return a few items I ordered online. We also go to the other mall and stop by Gap, Baby Gap, and H&M (which just opened in Anchorage!). These stops take entirely way to long as usual. Cullen is super happy during these stops, which makes me very happy. 6:00 p.m. We are finally done. Time to head to my in-laws so they can watch him while I do some computer work. 6:10 p.m. I catch up on e-mails, start this blog post, and spend entirely too much time on Facebook. 7:00 p.m. Thankfully they offer dinner to me, and I am not stuck eating scrambled eggs. 7:30 p.m. I spend a few more minutes working on computer items, but I see that Cullen is getting tired, so we head home. Classic Cullen with only one sock on. 8:10 p.m. We arrive home. I immediately start our bedtime routine: bath, pajamas on, pick up Cullen’s room. I usually brush his teeth and read a couple books to him, but I can tell he is ready for bed! I nurse him to sleep and he’s out by 8:30 p.m.
8:35 p.m. I clean up the kitchen and the downstairs of our house. (I still can’t go to bed unless everything is in its place.) I also upload photos to the computer for this post, write a couple of emails, and get things together for the next day. 9:30 p.m. I get ready for bed. I have to be honest, I wasn’t too confident about doing well at this race. The days leading up to the race I wasn’t able to follow my pre-race routine: I didn’t eat the way I usually do, half the time I kept forgetting I was racing on Saturday, I didn’t have the comfort of my own bed to sleep in, and my warm-up right before the race was nearly non-existent. But one of my strengths as a runner is that I can push the negative thoughts to the side and focus on the job that needs to be done. The day started out sunny, beautiful, zero wind, and absolute perfect racing temperatures (high 50s/low 60s). I didn’t have a super early morning wake-up call, but I didn’t sleep the best since someone is regularly up every 4 hours at night. But when my alarm went off, it was time to focus on the race. I got ready, had a decent-sized breakfast, fed Cullen one last time, and then caught my ride to the shuttle buses. The course was a point-to-point course, so we basically started 13.1 miles out of town. I only had maybe 5 minutes to warm-up before we had to board the shuttle buses to be transported to the start. 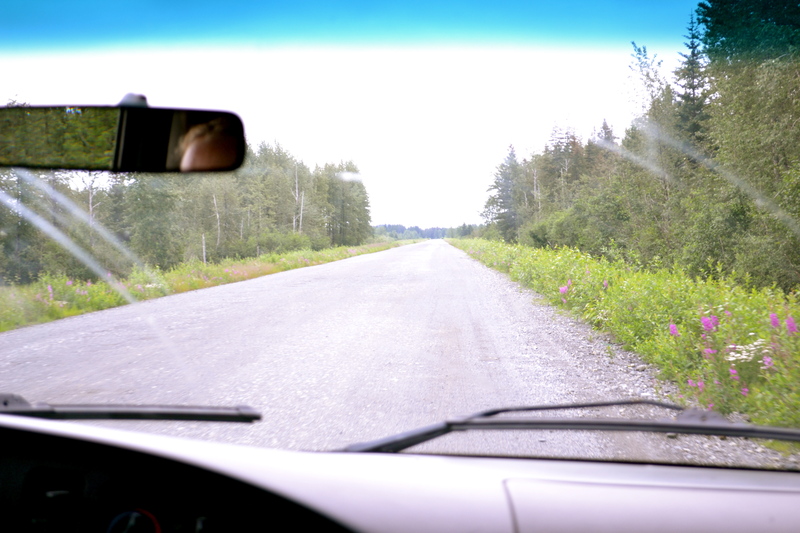 We started on this gravel road (pictured below), basically in the middle of nowhere. There were two orange cones lined up on either side of the road marking the start line. 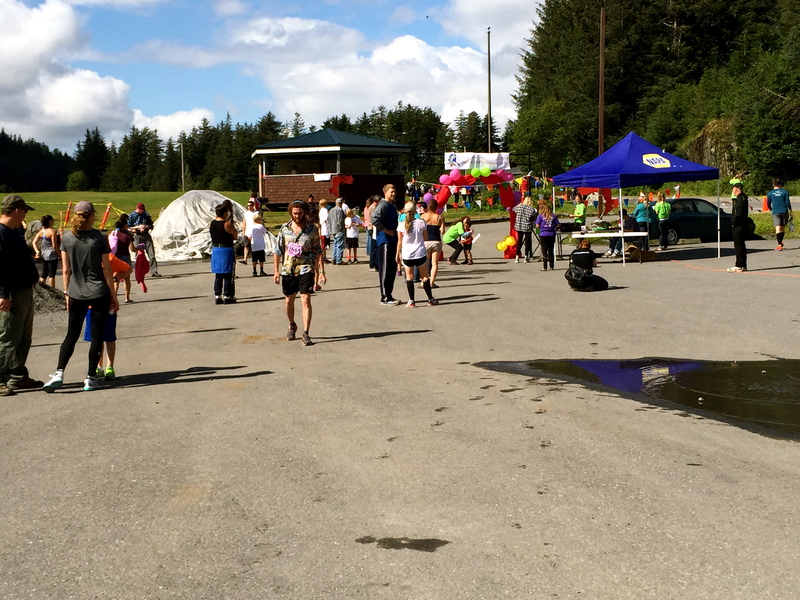 When we got off the bus, the bus driver (who also served as race official and starter) yelled, “Five minutes until the race starts.” People darted off into the woods to pee one last time. I did a few dynamic warm-ups and accels. I knew going into this race that there would literally be no time for me to warm-up. 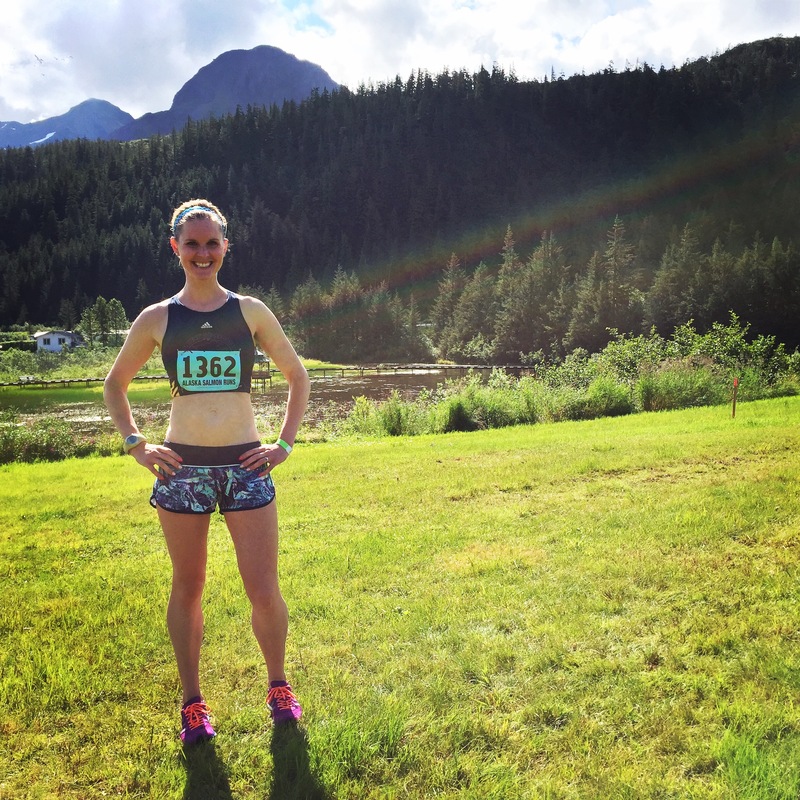 I usually spend about 30 minutes warming up for a half-marathon, so if I hadn’t known I wasn’t going to have any time, I would have been furious, and it would have gotten into my head that I wouldn’t do well. I knew I had to make the most of a short warm-up, so I did my best to get my muscles warmed up and focus on the race. I went out with two other guys from the start. The first two miles were on a gravel road. (Which I also knew only because I had met the race director a couple days before and asked her! Otherwise once again this would not have made me a happy camper.) The gravel road wasn’t too bad actually. I was able to find a pretty solid path with few rocks. After a few miles, we lost the one guy, so it was just me and a high school kid running together. We didn’t talk, but it sure helped with pacing and for me to keep the pace on the faster side. I started off averaging 6:35 – 6:40 pace. It was quick, but not too quick. I figured if I bombed later on in the race I would have some extra time in the bank. I knew I had to keep my pace at 6:50 or faster if I wanted to break 1:30. During the rest of the miles, my pace was right around 6:45 with nothing over 6:49, so we were very consistent. This kid and I kept plugging away at the miles. It was easy to keep an even pace as the course was flat. . . .pancake-flat. There was literally no hills or even a speed bump on the course–and there was even some slight declines during the last few miles. You couldn’t ask for a faster course! I was able to pull away from the other guy with about 1.5 miles to go. I cruised into the finish with the last mile being 6:31. When I crossed the finish line, I was shocked to see 1:27 on my watch. I had cut 2.5 minutes off my previous PR. I congratulated the second place runner, and come to find out this kid had just “gotten off the boat” which means he has been fishing all summer and not training very much, so he did awesome. I had a lot of fun running this race, and I feel very blessed to have run so well. This really boosts my confidence for the marathon in August. 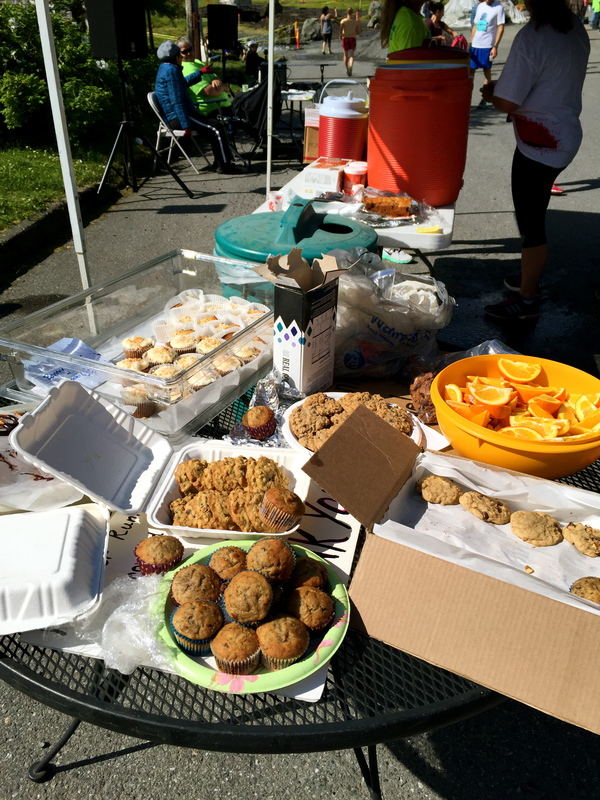 Only a small race would there be homemade baked goods. Love it! 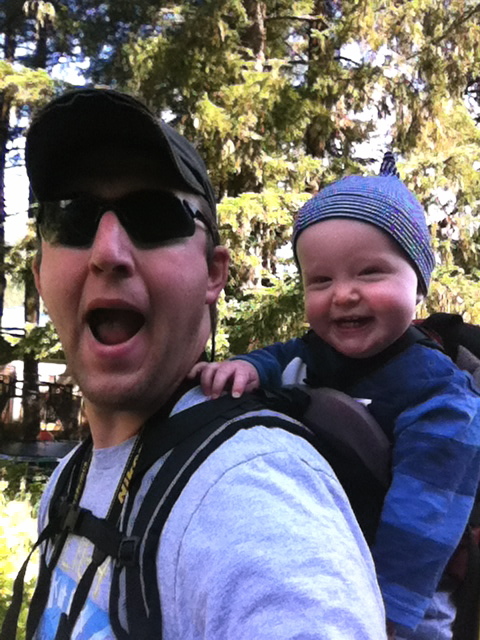 At the last minute Craig decided to walk the 5K with Cullen in the backpack. I think he liked it. The rhythmic motion always puts him to sleep. I don’t know how he was able to sleep with his head bobbing around. I would highly recommend the Alaska Salmon Runs if you are wanting to PR! It is flat, fast, and absolutely beautiful. We did catch some good weather, so I couldn’t guarantee no rain as it tends to rain quite a bit in Cordova. 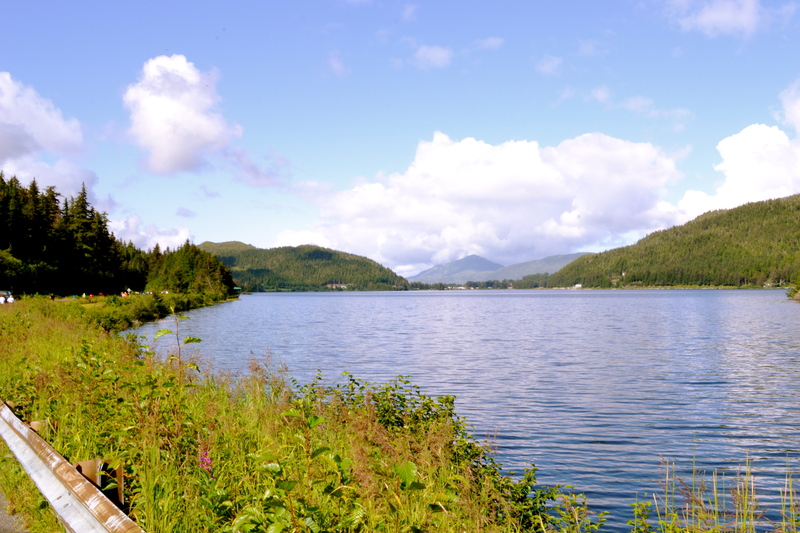 There were at least three people doing the half or full marathon in order to get Alaska checked off the list of running in all 50 states, so this could be an option for you if you are working towards that goal.